What for Bergamot-esque food and drink in a casual environment. Executive chef Dan Bazzinotti showcases charcuterie (one of his specialties), and wine director Kai Gagnon offers a list of off-the-beaten-path beverages. The scene Enter a long room with aubergine walls and seating that overlooks an open kitchen. Keep walking to the end and find yourself in a wood-paneled nook with a cozy bar. Gang of Four and Queen play as customers sip carmine-colored bubby Cerdon du Bugey and glasses of dry Alsatian Auxerrois. Gagnon makes the rounds, talking wine and music. At the bar, locals and Bergamot regulars mingle with staff. At the tables, romance is underway. A younger Bob Barker lookalike opines at length to a leggy paramour. A blonde who resembles chef Gabrielle Hamilton quickly kisses her date, who smiles and swipes his empty bowl longingly. 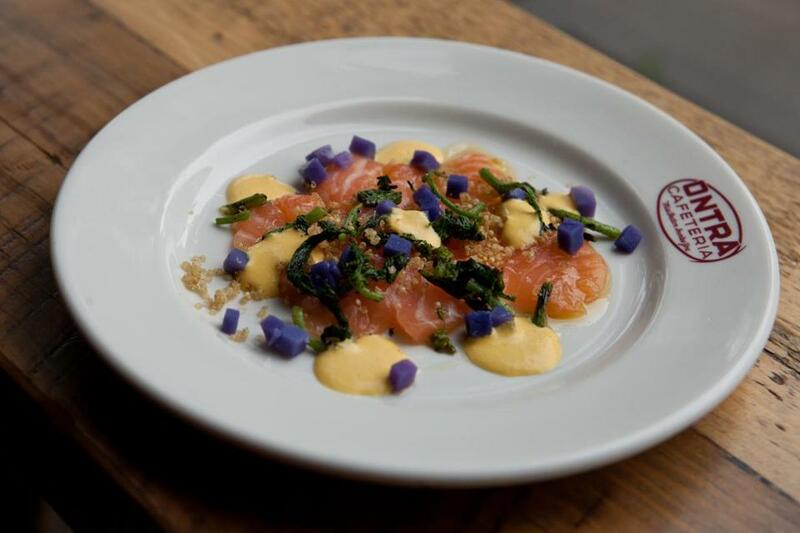 What you’re eating Charcuterie — maybe the Slim Jim-esque kabanosy or pastry-enfolded pate en croute, or go all-out with a “Bazz hook-up board.” Peruvian flavors are showcased in dishes like the salmon tiradito, with aji amarillo, crunchy quinoa, and purple potato. Small plates range from grilled nectarines with farmer’s cheese, salt-roasted turnips, and basil to cherry-glazed lamb ribs with green garlic chermoula. Care for a drink? The wine list takes drinkers on a tour of France, from the Loire east to the Jura and beyond. Beer drinkers find anything from Mystic Brewery’s fine saison Greensleeves to Stillwater Artisanal’s Vacuum, a smoked Indian black ale. 1071 Cambridge St., Inman Square, Cambridge, 617-714-3693, www.bisqcambridge.com.